Hello everyone! Lots still going on with Oh My Gods! Oh My Gods! has been accepted into the Boston Festival of Indie Games, New England’s largest indie game convention. It is one of the 48 games selected for the Tabletop Showcase and given our feedback, seems like a real contender for some of the prizes! If you’re in the Boston area and are interested in attending BostonFIG, please visit their website at www.bostonfig.com. That’s it for now! Talk to you soon! That’s it right there! We have a new Demeter, the goddess of agriculture; a new Atlas, the god of strength; and a new Zeus, king of the gods! We’ve been busy doing a whole bunch of boring behind-the-scenes stuff, including getting finalized quotes from manufacturers, pricing out some extras, working with distribution/shipping channels, applying for conventions, and working with backers to finalize the art for all games. We’ll be sending out a more complete update very shortly with some finalized things, including the backer survey, complete with options for our $50+ backers and art print options for the $30+ backers. We’ll also be voting on two options for the privacy screens – and one will come with a little bonus for those of you concerned about re-using paper! We also have a bunch of other things in the work for you, which are way to early to announce right now – but like I said, we’ll be sending out updates more frequently, so you’ll be up to date. Once again, I want to say a big thank you to all of you for your support. Without it, Oh My Gods! wouldn’t have been possible and I truly do appreciate it! Hello again! I’ve been asked by a few people to reveal my final stretch goal. And though we haven’t met the 3rd one yet, I figured I’d let you all know what the big plan was in the end. So with that in mind, I have updated the stretch goal image (below) to include the $9000 level Clue Sheet App. As you can all see, the game comes with 50 clue sheets. This is enough to play the game 10-16 times (more will be available as a .pdf on our website). However, the Clue Sheet App will allow us to put the clue sheet onto your smart phone and get even more plays out of it. It’s set for $9,000, which is totally doable within the next 32 hours. However, I know a lot of you are excited about the privacy screens, so let’s concentrate on getting those first! That’s it for this update. Now you know what the big plans are for the game. I’m just really excited that all of this is really happening! So I slept in this morning and woke up to something that made my week – we hit the 2nd stretch goal! Yess!!! Honestly, I wasn’t sure if we were going to. Mid-last week, Kicktraq.com was projecting that we’d hit between $4,400-$4,800 by project’s end – but we showed them! So now that we have linen-finish cards, it’s time for that stretch goal you’ve all been waiting for – the privacy screens! We have a few ideas out there for privacy screens, so if we hit this stretch goal, all backers will get to vote on which type they’d like. …well maybe all but Poseidon and Hades. But there’s no making them happy. We have one more event coming up during the Kickstarter. It’s the Boston University Day of the Devs, where local indie developers (both board and video game) get together to showcase their games. 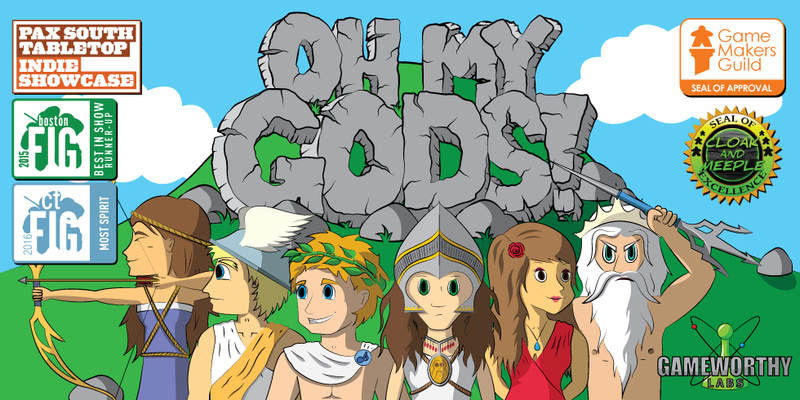 We’ll have some free tee-shirt giveaways, too, so stop on by and play some Oh My Gods! The last review of the campaign has been released and, as usual, is amazing! Rob atGeekDad.com did a great job of going over the rules and gameplay Oh My Gods! as well as says a lot great things about the game. My personal favorite is how he thought he wasn’t going to like it at first, but ended up really loving it! Check out the whole review here. That’s it for now, everyone! Once again, thank you all for your support! It’s great that we’re funded! I can’t tell you all how thrilled I am! We’re approaching $5,000, which is our second stretch goal, but it also a milestone that will allow us to do a lot more withOh My Gods! However, lately, our momentum has been flattening. For that reason, I’m issuing a call for action, which also happens to come with some great prizes! Below is an image created to help get the word out about Oh My Gods! This call is to spread the word about how great of a game it is. Post it on social media and tag us (@OMGsGame for Twitter or /OMGsGame for Facebook) to spread the word. A few lucky winners will receive OMGs tee-shirts, and some others will get their copy of OMGs signed by the designer (me!). So let’s get going on that road to $5k! So make sure to tell your friends about us and get them to back our game. The more backers we get, the more we can do with OMGs, and the better the game will be for everyone! Hey everyone! 16 days left and we’re still going strong! We still have more great reviews coming out and are just really excited for them all. I love hearing feedback, so if you’ve played, let me know! Come on down to both of these events and get your chance to play Oh My Gods! before it’s released! We got a new review in from the great people over at Board Game Duel, who said that Oh My Gods! is “quick, enjoyable and works well.” Check out the full review here. Play Oh My Gods! now! Hey everyone! We’ve got some great stuff planned for you in the next few weeks. If you’re in the Boston area, then stop on by Knight Moves Cafe. Knight Moves is a great little board game cafe with hundreds of games. It’s a great place to spend a night with friends, just relaxing, drinking coffee, and playing a game or two. Two prototype copies of Oh My Gods! are sitting on their front counter, just itching to be played! They just got there tonight, so bring your friends on by to play. Speaking of Knight Moves, we’ll likely have an event coming up there on March 21st. I’ll send out more information as it gets confirmed, but that would be a great night to stop on by, meet the designer (me) and talk about the game. We have one more event scheduled right now. On March 29th, we’ll be exhibiting Oh My Gods!at Boston University’s Day of the Devs. It’s a small, one-day event intended to showcase digital and tabletop games created by local designers. First Stretch Goal Reached, PAX East Success, and More Reviews! Hey there everyone! Coming at you with some great news all-around here. We’ve officially reached our first stretch goal of $3500, meaning that all Epic Hero-level backers (and above) will get a lightning bolt token with the base set! This little token is extremely helpful in deliniating who the thief is and I’m sure you’ll all be happy to have it! Looking at our second stretch goal, we’re bringing you linen-finished cards! The linen finish makes them much more durable and easier to handle. A definite plus when you play the game over and over again (as I’m sure you all will). This stretch goal is set to $5000, so reach out to all your friends and get them to back us, too! The more people we have playing Oh My Gods!, the better! I had a great PAX East this year and a lot of it was thanks to Oh My Gods! I sat on two board game design panels on Friday, discussing game design and playtesting. Then, spent Saturday exhibiting Oh My Gods! at the UnPub.net booth. Not only did hundreds of people get to play it, but I didn’t hear one bad comment. We most commonly heard “That was fun” and “I really liked this.” It was also a great idea generator, as some of pur conventioneers got creative with ways to make Oh My Gods! even better. And, in fact, a lot of you backers got your first taste of Oh My Gods! at PAX! We also have a great how-to video and commentary from Bower’s Game Corner where Forrest gives a very thorough how-to and talks about the types of players who might like the game (hint: there are a lot!). Check out his video review here. Finally, we have another great review from the guys over at Game Night Guys, who played Oh My Gods! during their most recent podcast. These guys are hilarious and you’ll really enjoy how they make fun of (and mispronounce) the Greek gods, too. They all enjoyed the game and gave us a new idea – The God of Bacon! Check out their podcast here. That’s it for today! Keep getting the word out there so we can reach our next stretch goal! The more backers we can get, the better Oh My Gods! will be in the end! Thank you to everyone for all your amazing support I’m so happy to say that OMGs is going into production! This is amazing! Thank you, thank you, THANK YOU! The next stretch goal has now been revealed! For $1000 more dollars, we’re going to include the Lightning Bolt token in all versions of the game. It’s a great piece that helps you keep track of the thief. Let’s look forward to hitting this goal, too! We have a few upcoming events up, including one tonight! We’ll be at Pandemonium Game in Cambridge, MA. from 6pm to 10pm. If you’re in the area, stop on by and get a first look at Oh My Gods! Once again, thank you all so much! I am so humbled by all this amazing support.